There is evidence that a person’s readiness to engage in self-management (their “level of activation”) may be increased by support from staff in the use of various tools or interventions focusing on the development of skills and on building confidence. Can the use of intervention tools help to improve the knowledge, skills and confidence of patients with kidney disease to enable fuller participation in the management of their own health? 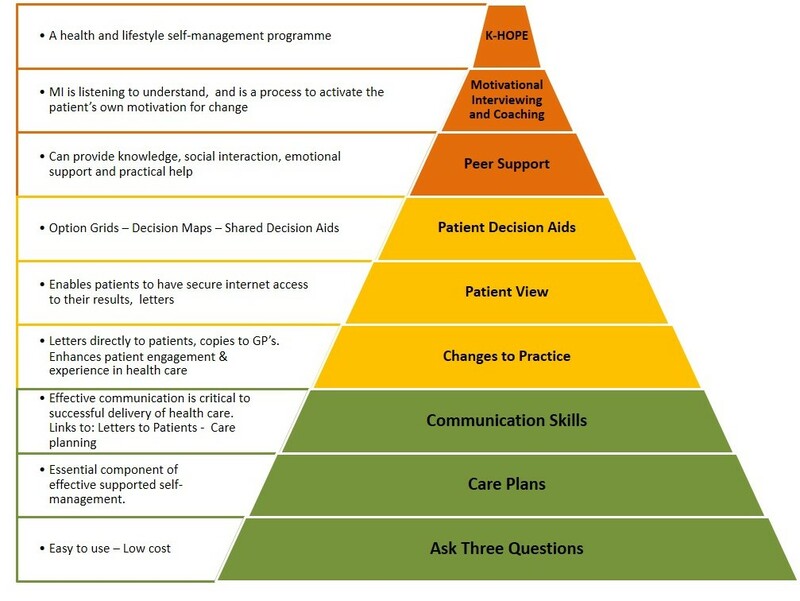 The following Tools for Change can help patients, family members and staff to use clinical appointments more effectively and can enhance engagement of patients in their own care. Clicking any of the links below will take you to more information about the relevant intervention and about how it can be used to improve patient knowledge skills and confidence which are pre-requisites for effective engagement. The linked pages also include case studies and blogs from renal units with experience in using these tools, as well as other useful links and resources. The intervention tools above are depicted in a pyramid below. These interventions are recommended for both clinical teams and patients. Some are appropriate for patients and some for health professionals. All require engagement of both and potentially benefit both. These interventions are not prioritised. Those at the base of the pyramid are categorised as being easily implemented, applicable to all and requiring little resource. We recommend that all units consider implementing them. Those in the centre of the pyramid might be offered to all patients although not all will wish to participate. In order to implement these interventions some organisational change may be required. The interventions at the top of the pyramid are less easily implemented, not universally available and may involve organisational change and cost. We regard these top-level interventions as suitable for specific patients or staff who are likely to benefit from them. This will require case-by-case assessment. The Interventions Toolkit can be downloaded here. An additional resource and literature search has been developed by Nathan Samuel and can be downloaded here. The TP-CKD Programme is funded by NHS England who have some additional useful resources and information on their website. You can access this information by clicking on the links below. We invite you to try out these tools for change. We welcome your feedback on these tools. You can contact us here.